Boy, I haven't been very creative with the blog post titles lately. I'm purposely keeping it short & sweet and just a simple what's on the needles post today because sadly, I've succumbed to the Patient First Creeping Crud disease. It's not the flu, but I feel oogy. I'm living on a cocktail of Mucinex, Sudafed & Tums. Apparently the Mucinex-Sudafed combo causes incredibly horrid indigestion. I haven't been knitting much. Yesterday, I didn't wake up until after 1 p.m. and last night/this morning, it was after 5:30 a.m. when I was finally able to fall asleep. And of course, I woke up at 7:15 a.m. and couldn't go back to sleep. So today, I'm just plain stupid. Stupid with a massive case of indigestion. That kind of stupid where you turn the washing machine on without putting any dirty clothes into it & you dump the dog food into the water bowl instead of the food bowl. So yeah, I'm feeling oogy & cursing Patient First's germy air. On the bright side, Zack's broken thumb is doing well. It's still a rainbow of colors but the swelling has gone down considerably and as long as he keeps it splinted & doesn't bump it on anything, he says it doesn't hurt. Actually, he says the tetanus shot hurt worse than the broken thumb. I'm just glad his thumb is looking more like a thumb should look. When he first broke it, his knuckle was swollen up more than twice as high as normal, plus the skin was split open & oozing blood. And, as if that wasn't bad enough, the pad of his thumb had a horrible lump protruding out & downwards. I can't believe we didn't take pictures. It was my baby's first broken bone after all. Happy New Year's! Be safe out there. Unless you count killing the poinsettia, not a lot of progress has been made around here. Apparently, poinsettias don't like coffee. Who knew? Spider plants love coffee! I have one spider plant that I've owned since 1989. It has thrived on a diet of mostly coffee with only an occasional shot of water. But one dose of coffee was all it took to kill the poinsettia. But to get back on topic, what's on the needles? It's the Cape Cod mitt. Still. I started it Friday while sitting in Patient First waiting for verification that my son had broken his thumb. To be honest, we were in Patient First for so long & I'd knit the entire time we were there and by the time we got home, I was sort of sick of knitting. Six hours of straight knitting will do that to me. Saturday was spent doing a mountain of laundry which included re-washing one particular load for the third time. Yes, I'm prone to forgetting I'm doing laundry & not remembering until days later when I go to start a new load only to discover the old load is still in the washer, wet & moldy. But that particular load, I'm proud to say, got re-washed, dried & even put away into the proper closets & drawers. Saturday was also spent at the grocery store buying lettuce. You know you've eaten too many Christmas cookies when all you want is lettuce. I swear, if I never see another grain of sugar or a stick of butter, it will be too soon. Sunday was spent happily munching lettuce & watching a bunch of my favorite '80's Netflix movies that will be disappearing on January 1st. I also started working on my knitting list for 2015. You know how I love a good list. Anyway, all I can say is that I hope 2015 is a very long year. 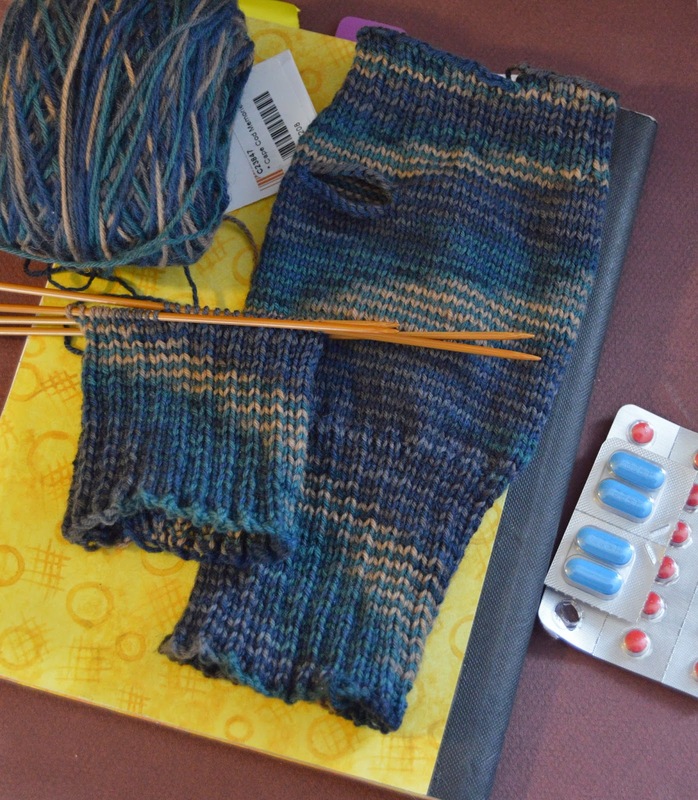 There's 27 items on my Things to Knit in 2015 list. Twenty-seven! Twenty-seven things & the list doesn't even include all the new patterns that will come my way during the year. Good grief! Sarah can parallel park. Granted, it takes her about 45 minutes, but she can do it. I hope everyone had a wonderful Christmas. We sure did. Sarah helped Minnie & Max hang their stocking. Minnie LOVES the stocking & what it means & wasn't very happy about sharing it this year. Zack helped his 4 legged siblings open their stocking. Max was overjoyed to discover Santa had brought him a huge bone. He was not overjoyed at having his picture taken though. He does not like having the DSLR pointed at him. If you are noticing a lack of human pictures, it's because I'm trying to honor the families wishes not to show up here on the blog. Sarah will have to get over it though. Here's what her cake stand cover hat looks like on. Just ignore the weird, "please stop taking my picture" facial expression. I was super excited to discover Sarah had gotten me the Buffy heart necklace we found in a consignment shop. Sarah commented that she didn't remember Buffy wearing a heart necklace & I immediately responded, "Oh no, Buffy doesn't wear it. Zander gave it to Cordellia for Valentines Day." Then Sarah went off on a rant about how I can't remember her name half the time, but I know Zander's & Cordellia's and how they spent Valentines. What can I say? I'm a Buffy the Vampire Slayer fan. And I've been dying for a similar heart necklace ever since I first saw the episode. I also got monogramed salt & pepper shakers from my friend Traci at Dogwood Shade Arts. I also discovered that I can knit almost an entire hat & start a pair of matching fingerless gloves while sitting in Patient First. My son broke his thumb at work late Christmas night and we spent yesterday, as in all freaking day yesterday (well, okay, to be honest, just a few minutes shy of six hours but that's almost all day) in Patient First getting him taken care of. If we didn't catch the flu while we were there it will be a miracle. I have never seen so many sick people in my life. We hung out in the waiting room for about 3 hours & the whole time, there were at least six people having to stand while they waited because there weren't enough chairs for all the patients. I can't complain about Patient First though. They were just swamped with post-Christmas flu patients plus I guess it took a while to get the workers' comp approval to treat Zack. What ever. As long as we don't get the flu, I'm happy. I got the hat finished (it only had ribbing when we arrived) plus I started the mitts and Zack got x-rayed & the break confirmed, bandaged (his knuckle was split open, eeww!) splinted, an updated tetanus shot and several prescriptions for pain meds & an anti-inflammatory and we didn't pay a cent. I was pretty impressed with Bowl America's workers' comp procedure. And, luckily, it's Zack's left thumb so as long as he lays off the pain pills, he should be able to bowl without too much trouble. And of course, go back to work. I gotta hand it to the kid & his work ethic. The doctor gave him a note so that he could stay out until Monday but he went in this morning. Of course the big question is, can he do his job one handed. Christmas, 1965. Every Christmas that I can remember, my cousins always wore their red suspenders & holly bow ties. And I was always slightly jealous that I wasn't a boy because I wanted to wear them too. We're throwing back Thursday a day early. Our family's tradition is having the oldest male in attendance read The Night Before Christmas after dinner on Christmas Eve. As a child, it was always my grandfather. Then the honor was passed to my dad who passed the duty on to my brother in law. I have spent two years away from my family on Christmas Eve and both of those years, I forced found others to read to me. One was a stranger who thought I was completely nuts but he complied anyway and actually seemed to enjoy it. These days, I always tear up just a little during the reading as I remember past Christmas's and loved ones who are missing from our lives, but it's the one tradition I refuse to ever give up. It would be painful to skip the Christmas tree and the special holiday foods and the gift giving & receiving but I could live through it if necessary. I would not survive if someone didn't read me The Night Before Christmas. Things are starting to feel a bit less frantic. Sort of. The baby blanket bind off is complete. It's this year's Christmas miracle! The shopping is finished, eight batches of rum balls have been made, nine batches of cookies are cooling on the racks, there's a cake in the oven and there's a plan in place for delivering the gifts. I think, thanks to a great deal of help from my daughter, we are ready for Christmas. Okay, so I know this blog is supposed to be about knitting and it's been a week, maybe more, since I've posted any pictures of anything remotely knitting related but today won't be the day to break the streak. I'd planned to show pictures of the finished baby blanket but Someone accidently forgot to turn off the camera the last time it was used and the battery is beyond dead. I'm just glad I discovered this today rather than tomorrow night in the midst of the Christmas festivities. A house that I hope made the tacky lights house tour. And a human Christmas tree. While shopping the other night, Sarah & I stopped off at a Chili's to grab a bite to eat. Seated near us was a large group who were all dressed... festively. Not quite as festive as the tree person, but festive. At one point, they all stood up, sang a Christmas Carol & danced around. It was a Christmas carol flash mob! Holy Moses, how did it get to be December 22 already? I will be lucky if I'm done preparing for this Christmas by next Christmas. Good grief! I'm on Day 18, or at least that's what it feels like, of the baby blanket i-cord bind off. Good grief! Who knew baby blankets were so freaking big. I should probably admit that I've reached that "I can't face this any more" stage of baby blanket i-cord bind off that has caused me not to knit for two days. Two whole days! Two whole days without knitting a single stitch. Good grief! I won't allow myself to start a new project until the bind off is finished but I can't seem to force myself to do the bind off. We are at a stalemate. 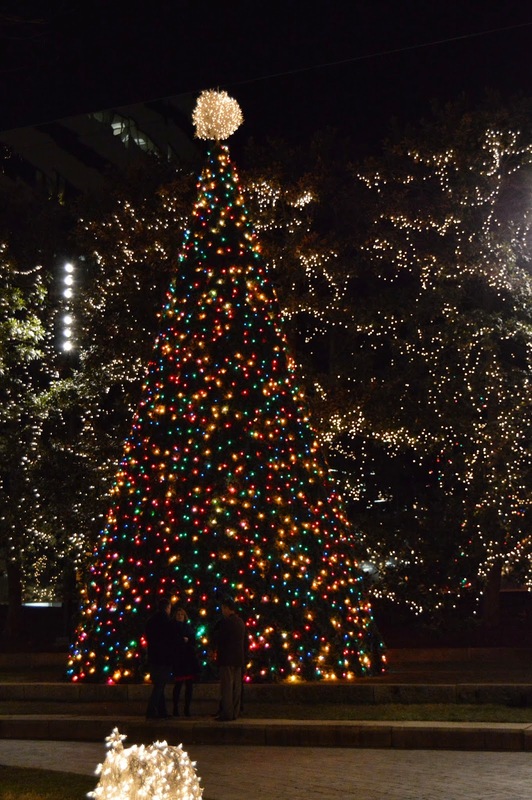 Instead of knitting (or baking, or wrapping, or sweeping up pine needles or gift delivering....) Sarah & I took a spur of the moment trip to downtown Richmond to see the lights at the James Center. The lights were beautiful, but it just wouldn't be Christmas without a horse-drawn sleigh carriage. This one's a little blurry but... This dude is an amazing bucket drummer. Having failed guitar lessons back in my youth, it absolutely amazes me that someone can bang on a bunch of plastic buckets & make it sound like something. If I ever divorce my husband, you can pretty much guarantee it will be over his rum ball behavior. Several years ago I stumbled across a recipe for bourbon balls that called to me. I don't know why. I wasn't a huge fan of bourbon balls. I much prefer my bourbon straight, in liquid form. But I got it in my head to make a batch to give as gifts. I had everything I needed to make them on hand except the tins. As my luck would have it, while I was at the tin store, dear husband & his buddy were at home drinking the bourbon. And as things like that always happen in my household, I didn't discover the missing bourbon until I was elbow deep in all the other ingredients. Standing there, peering into the bourbonless liquer cabinet, I caught sight of the Captain Morgan's Spiced Rum. Hmm, it's the same color... We have a full bottle.... It'll work. It turns out, the Captain Morgan's makes a HUGE difference. A huge, wonderful difference. And that is why I may one day divorce my husband over rum balls. I can not make them fast enough. The folks I gave them to that first year have demanded I make them again each year. And let me say, a few of those folks haven't been very subtle with their demands. The rum balls are that good! So every year, there I am, standing in the kitchen, making hundreds (literally!) of bourbon balls while my husband eats them. Eventually, he eats enough to either get a belly ache or a hangover & he wanders off. Finally! I fill the gift tins, clean up the mess, and mark "Rum Balls" off the to-do list while sipping the last of the rum. And the next day, I find at least one open & empty gift tin. I take one look at dear husband & yep, he's got a big, guilty grin and powdered sugar on his face. Throwback Thursday is looking back to 1964. I was two. I don't remember the crib, playpen or is it a jail house? What is that thing?? But I do remember the doll. I loved that doll! By the time I was eight or nine, the doll's name was Dirty Baby. I also had Pretty Dirty Baby. As you can guess by their names, they were both obviously well loved, and well, pretty dirty. I think this was the Christmas when I pulled the tree down. Perhaps just moments before this photo was taken. Slight progress has been made on the gray & white spiral blanket. I started the ruffle very late last night, or very early this morning, depending on how you look at it. Only a few rows have been knit so you can't really tell. I sure hope that once a few more rows are knit, the contrast between the two yarns will show up more. I also hope that one skein of the gray will be enough to finish the ruffle because it's all I have. Notice the poinsettia? It's my version of Elf on a Shelf. That poor plant gets moved around from place to place on an hourly basis it seems. It was supposed to sit on my desk but remember this fiasco? Yeah, well, the fiasco is on-going and the poor plant is constantly in the way. I also keep forgetting to water it so it's having a hard life. I hope it forgives me. I'm wishing all my Jewish friends a happy Hanukkah. And because it never gets old, no matter what your religion is, The Hanukkah Song. Meanwhile, I have a question for you. When speaking of, say, a hat or scarf that could easily be worn by either male or female, do you call it a unisex hat or scarf, or is it a gender neutral hat or scarf? Or would you call it something else entirely? I ask because I've always said unisex, but I was recently reading a forums post where the issue was being discussed argued. Several people felt that the term "unisex" was disrespectful & insulting. In fact, the conversation had become so heated & insulting, I chose not to take part in it. But it got me thinking. Am I really that old & out of touch with things? How is calling this hat, for example, a "unisex hat" disrespectful & insulting? I don't understand. Keeping in mind I'm talking about things, apparel items for the most part, not people, what is so wrong with the word "unisex"? If you have opinions on this, please share in the comments. I'd really like to know. But please, be respectful & use your inside voice. Don't yell at me, teach me. Once again, the Christmas Panic knitting is moving along at a snails pace. Another pair of fingerless gloves/ fingerless mitts/ wrist/hand warmers are complete. They were supposed to be solid black but I ran out of yarn & had to get creative. Actually, I sort of like the two-toned look. And I'm making progress on third & final pair. One down, the second has been cast on & a few rounds knit. If you notice the size difference, the red pair are supposed to be smaller, for girl with normal sized girl hands. The black ones are for a man-boy with normal sized man hands. The hand model itself has a normal man-sized palm with very long & delicate fingers. Before becoming a glove model, The Hand was apparently a pianist. So, what do you call those? For some unknown reason "mitts" sort of makes my skin crawl. But they aren't mittens, nor are they gloves. They do warm your wrists, but they also warm your hands. And "hand warmers," to me at least, are those packages of chemical that you put in your pocket after whacking them to mix the chemicals that create the warmth. So, what do you call them? Our big Christmas light display. Sorry for the blur. I should have used a tripod but didn't. As dark as it was outside, it took what felt like 15 minutes for the camera to actually take the photo and I've never been known for my ability to stand still. Anyway, there's a picture of my big icicle lights adventure. Normally the men in the family are in charge of the outdoor lighting but neither of them had time this year. I got tired of waiting, threatened to do it myself and well, I lost that battle & had to actually do it myself. Have I mentioned that I don't do ladders? I stand on a one-step up step stool and get dizzy. So there I was, up on a 10 foot ladder with a bad case of plumber's pants & my sweat shirt riding up around my arm pits cussing & practically gagging from being so high up in the air. I think I owe the neighbors an extra plate of cookies this year. Or as I pronounce it, point-set-ta. It makes my kids crazy but hearing someone say it with the "i" that sounds like a long "e" drives me even crazier. Just one of those quirks that I know you were dying to learn about. Not much knitting has been taking place. 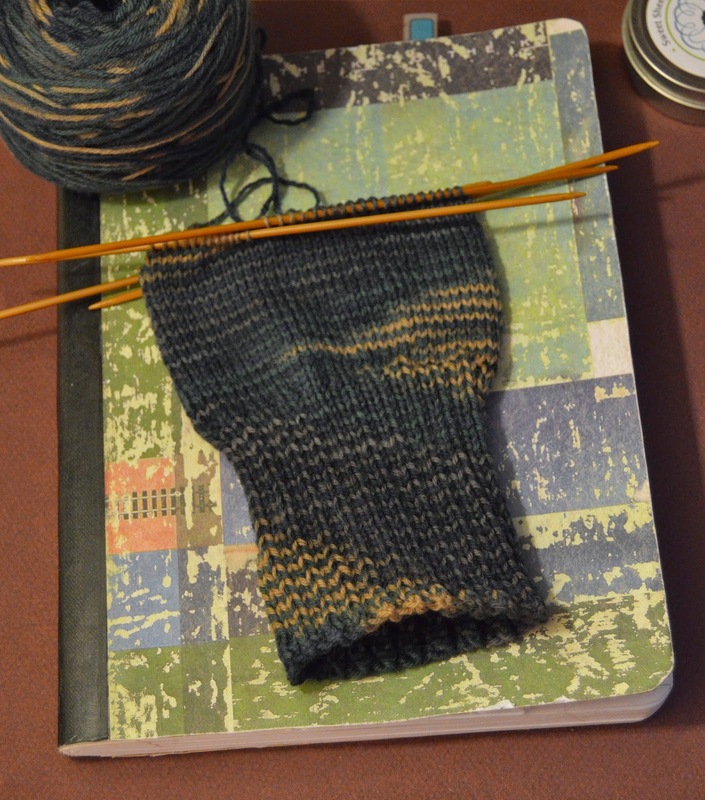 One pair of very plain & very large men's fingerless mitts is about all I've accomplished. I continue to procrastinate on the Christmas Panic knitting by attempting to cram all the furniture, yarn & miscellaneous craft supplies into an area way to small to hold the furniture, yarn & miscellaneous craft supplies. I've also managed to procrastinate on that project so much that it's still going on. I can't find anything. There's so much stuff piled up in weird places that even the dogs are freaked out. I have, however, amassed a zillion quotes to use on my 2015 Twitter quote of the day posts. So there's that. And if I can manage to stretch out typing this blog post for another hour, it will be too late in the day to decorate the outside of the house for Christmas. And if I can procrastinate on decorating another couple of days, it will be too late in the season to even bother & I won't have to do it at all. The only glitch is, the girl child wants me to take her to the mall tomorrow. I think I'd rather outdoor decorate than go to the mall. Maybe tomorrow some new crisis will pop up that I can use to get out of going to the mall and decorating. Something like the sudden, urgent need to reorganize my spring clothes. Yeah, that actually sounds like something I should do. Pronto! Oh, and by the way, watch out! The Sarah finished (and passed) drivers' ed yesterday. She won't be able to get her real driver's license until April because she has to have her learner's permit for a certain amount of time but she thinks she's finished learning. I think I need to be Googling for one of those "How's my driving? Call my mom" bumper stickers. No matter how you pronounce it, happy Poinsettia Day! I don't remember our family ever having matching Christmas pajamas but apparently, we did. And I don't look too happy about it. Although it's not exactly a good picture of any of us, I like it because of Mom's expression. After playing Santa the night before, you can see how she doesn't even have the energy to look up at the camera. Five? Forget five. If you take your procrastination seriously, you only need one. I decided to rearrange the furniture. Mike had brought home one of those desk top things that fits over two filing cabinets. For unknown reasons, I've always wanted one of those desks. Now I was going to have one. Never mind it meant switching file cabinets with Mike and loosing an entire drawer. Never mind that the table I was using as a desk seems to have grown 3 feet wider in each direction & no longer sits quietly in the middle of the room waiting for someone to come craft on it like it used to. Never mind that in the process of moving things around, I made such a mess the vacuum cleaner wouldn't fit into the room. Never mind that I had to move furniture in order to make space to vacuum. Never mind that it took me over an hour to find my phone in the mess. Never mind that all the boxes of Christmas decorations were already cluttering up floor space. Never mind that I tried to move a table with my full coffee cup sitting on it. Notice the word "tried" in that sentence. Never mind that I had to move even more furniture in order to mop up the spilt coffee. Never mind that the next day, the room still looks pretty much like it does in that photo & I have totally lost the urge to rearrange. Never mind that I don't really like the new desk format. It's got a much smaller surface area and the pencil drawer hangs down & prevents me from crossing my legs. Can't even comfortably cross my ankles. Never mind that I'm throwing myself a giant pity party and have decided to knit Christmas gift mittens instead of cleaning up my huge, giant mess. So, whether you are looking for an excuse to procrastinate or motivation not to procrastinate, rearrange the furniture. Preferably after bringing in an additional piece of large furniture. And make sure that in the rearranging, you have to trade furniture "ownership" with someone. Trading dressers or closets would work if you don't have file cabinets. And that folks, is the only procrastination tip you need. It's an Alley Cat hat. Its ears are crooked & one is a row taller than the other but I'm beyond caring about this project. And being a rough alley cat hat suits. It's got character. It's recipient is Alli, who we all call Alli Cat. At the great age of two, Miss Alli Cat is a wild woman and will most likely not notice the crooked ears. In a moment of Christmas knitting panic and still floating on waves of relief from finishing the cat hat, I couldn't decide what to knit next. I picked up the gray & white surprise that I'd been saving for travel knitting. After a day spent watching bad Christmas movies on Netflix while, it's no longer a surprise. Or travel knitting. Its pretty obviously a spiral blanket. A spiral blanket that has reached the pain in the arse stage. It's now on three lengths of connected cable which refuse to lay in a circle. The cables are determined to twist in weird places and won't allow the stitches to easily slide around & around. And, since adding the third cable, one needle tip keeps coming unscrewed from the cable. I would like to make the blanket much wider but my patience level is wearing thin. By the way, if you are looking for a new bad Christmas movie to watch.... I loved Danger in the Manger. It was stupid & had a lot of potty humor, but it also made me laugh. It was the perfect movie for my post cat hat knitting mentality. Besides, it's got a few of my favorite features. Funny trials & tribulations along the journey, the underdog wins without actually winning, and funny little kids speaking in British accents. What's not to love about that? Dammit! I knew there was a reason dogs rule & cats don't. See the problem? And yes, of course I knit that pink ear in intarsia, not duplicate stitch. And yes, this is the second ear attempt because the first attempt was WAY off center, like, sticking out of the back of its head off center. Argh! I am obviously not loving this free pattern I got off Ravelry. The hat part was simple but those damn ears.... It seems the pattern is simply the designer's design notes typed up and not an actual pattern. The pattern would probably make perfect sense after someone had knitted the hat correctly but as for being understandable instructions for panicked Christmas knitting, not so much. If ear attempt #3 goes as poorly, I'm tossing the whole project & buying a cheap acrylic Hello Kitty hat from Walmart. No I won't, because I'm never stepping foot in Walmart ever again. But the Great Niece won't be getting a cat hat for Christmas either. It's good to be weird, specially this time of year. 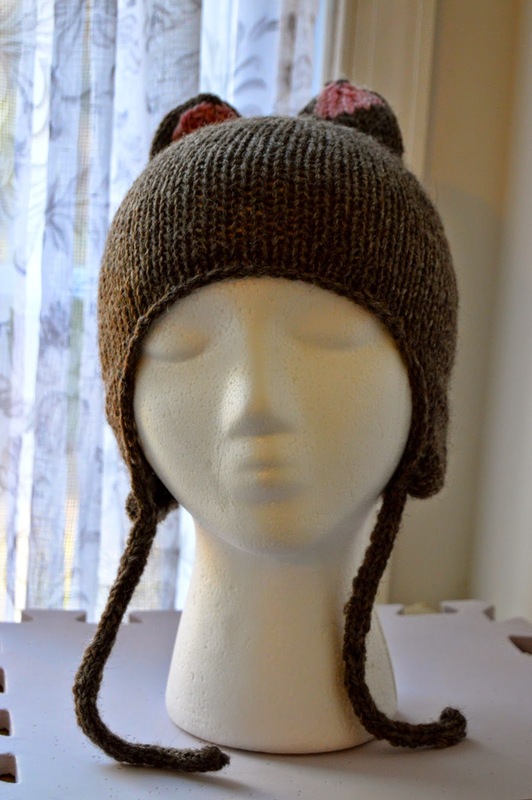 It comes in very handy when you are a knitter who knits Christmas gifts for family members. Nosy family members who notice odd things sitting around being blocked. The slouchy, lacy tam/hat is finished and being blocked. Being blocked over a cake stand because it's the largest circular thing I could find. Pattern instructions always say to use a dinner plate but when you knit for Texas sized heads, dinner plates don't cut it. Anyway, the recipient notices the tam being stretched over the cake stand & since she doesn't recognize the knitting as being a hat, she starts asking questions. She now thinks I'm knitting cake stand covers for my Etsy shop. Which, since she already thinks I'm weird and might actually be inclined to knit cake stand covers, is totally believable. 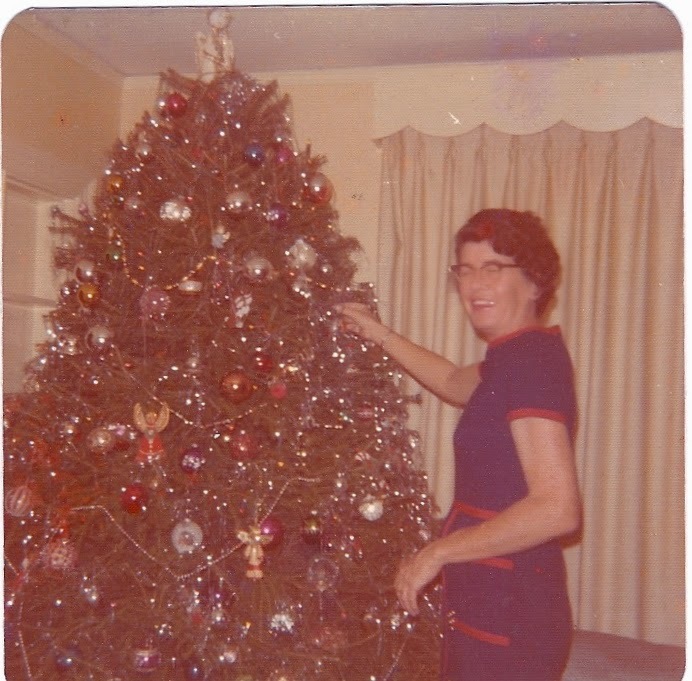 A rare photo of Mom decorating the tree. It's rare because Santa decorated our tree. I have no idea how Santa survived our family. Not only did he deliver gifts but he also decorated our tree. The week before Christmas, our family would pile into the station wagon, candy canes in hand, and go in search of the perfect tree to chop down. We never went to tree farms, we traipsed into the wild in search of the perfect tree. Some years we cut it down & strapped it to the top of the car right away & some years we tied a ribbon to it & Dad went back later to chop it down. I never gave it any thought as a child, but when I think back on it, I sure do hope that some stranger didn't wake one morning to find that their prized tree had been removed from their yard. Anyway, we'd commandeer our tree & bring it into the house on Christmas Eve Eve morning. It would thaw out during the day while Mom did her last minute baking & gift wrapping. That night, Mom would put the lights on the tree while Dad sat in the rocking chair supervising & I jumped up & down in excitement. Christmas Eve morning was always exciting because by then, we'd know what kind of nests had been hiding in our tree. There was more than one morning when we came downstairs to find our living room covered, and I mean COVERED! with baby spiders or strange bugs that had hatched overnight due to the warmth of our house. After Christmas Eve dinner at my grandparents' house, we'd come home, open one gift (always a book. We knew who gave us books each year & my sister & I would read ourselves to sleep that night.) Later, after my sister & I had finally read ourselves to sleep, Santa would come. He not only left gifts under the tree for us but he had to put our doll houses & bikes together AND decorate our tree. And we had a LOT of decorations! Our tree was always the gaudiest thing you've ever seen, but we loved it! Santa definitely earned some love & respect in our household because there were plenty of 5:00 a.m.'s that rolled around when my sister & I would wake up & find Mom & Dad in the bathroom brushing their teeth. We always thought they'd gotten up before us, but I have the feeling we were wrong. On the needles today is still the lacy, slouchy, Christmas gift hat. Hmmm, there's a lot to say about that photo. First, Mr. Creepyhead is modeling it rather than Mrs. Creepyhead because Mrs. Creepyhead is more child sized than adult female sized and that hat will be a gift for someone who shares my DNA which means their head is the size of Texas. Second, it's actually a pretty lace pattern. Simple, but pretty. It will look much better after blocking. I hope! Third, I can't tell if the photo is blurry or not. One minute it is, the next minute it looks clear & crisp. I've been dealing with a migraine since yesterday morning but luckily, (maybe, depending on how I look at it) rather than the massive headache, my vision is impaired. Everything is sort of wavy & slightly acid trippy. (Or should that be tripy? Obviously I don't know my spelling rules & SpellCheck wasn't around in the 60's & doesn't recognize it.) Anyway, my apologies if the photo is way out of focus. Fourth, the hat is knit with Knit Picks Palette in Garnet Heather with my new Knitters Pride Karbonz US 3 interchangeable needles that I bought from Webs. The needles are super pointy & great for lace. I may have to ask Santa for a full set. I haven't made a ton of progress on the hat because it's my "at home" project and I haven't been at home. My daughter's drivers' ed has taken over our lives and we've been spending 6+ hours a day (counting travel time) there. The class is too far away from our house to come home between dropping her off & picking her back up so I've been spending a LOT of time at Starbucks. I haven't mastered the art of knitting lace, reading and people watching all at the same time. And there are some very interesting people to watch at Starbucks. But, progress will be made soon. Sarah had her behind-the-wheel test last night & passed with flying colors. Another week of classroom learning & she'll be done.